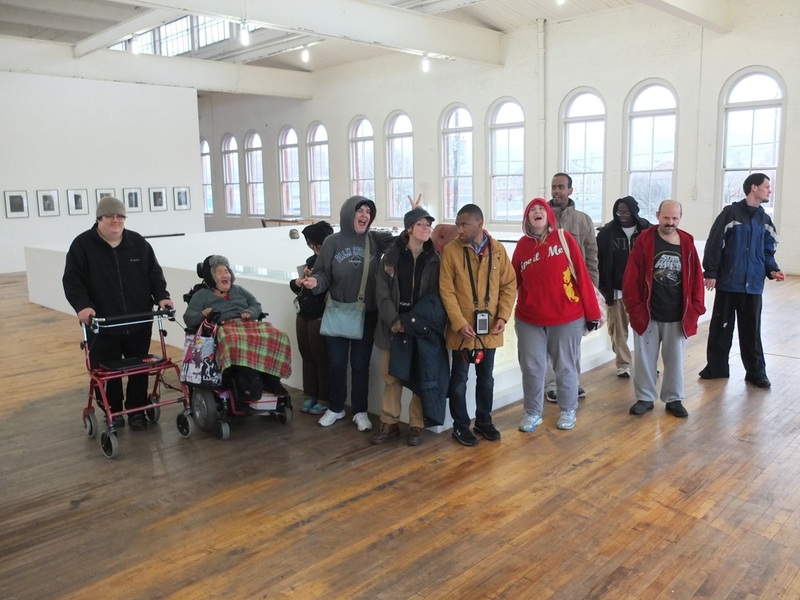 Members of Project Grow excited to visit a new gallery. The underlying social context for the need of a program such as Project Grow is mainly with the social identity category of ability/disability. The targeted social group are people with disabilities. The "ableist" societal world-view is that the able-bodied are the norm in society, and that people who have disabilities deviate from that norm. It is viewed that a disability is something that must be overcome. Alongside the ableist view came section 14 (c) of the Fair Labor Standards which allowed nonprofits to pay piecework wages. Paying disabled workers according to their abilities (by piece), with no bottom limit to the wage (sometimes pennies an hour) which meant that most workers would not earn a living wage. Recently, the settlement terms of a lawsuit against the State of Oregon will phase out 'sheltered workshops' and transition people into the general workforce. Project Grow is the epitome of the opposition to the menial-wage sheltered workshop. However, since they are labeled such, it is uncertain how the settlement will affect their state and federal funding. nderstanding diversity is essential to lift the oppression of the social context within the community of persons with developmental disabilities. We need curiosity of who they are beyond their defining disability, so we can be inclusive of one another, and transformation will be inevitable. Just considering the artwork begins to dismantle that barrier. Communication is essential in order to be empathetic and truly understand their needs. If work is done without the needs in sight, then the work will often not be as effective as it could be. With a progressive art studio and an urban farm, I have a unique variety of work to chose from during my time at Project Grow. Although, producing a new archival system was essential to their needs to sustain the future of the program. I can always work with the chickens and goats another time. Critical Thinking is to be creative in the ways in which we go about creating projects and lifting oppression. It usually is not the most straightforward plan that works out in the long run. With such a large project, and various hands and ideas to help, I am always looking at ways to make the archival parties a wonderful experience. Also, I am creative with keeping track of where the project has deferred, post-it notes and memory mnemonics. It is everyone's social and ethical responsibility to do what we can do to lift oppression. The Platinum Rule: treat others the way they wanted to be treated. Do that for others because you may one day need them to do it for you. Let us encourage the world to understand that it is everyone's responsibility because we are interconnected. The butterfly effect: the phenomenon whereby a minute localized change in a complex system can have large effects elsewhere. The longer I volunteer at Project Grow, the more effect it has on me now and relevantly later, in the studio, at home, at school, in my relationships. I am convinced that the members of Project Grow are effected the same way. Project Grow was the first of its kind in the nation. That is unique and deserves to be preserved, especially for the members of Project Grow in providing a safe space to foster independence. Once the connection is made between artists and opportunities, the door is opened for these connections to happen on their own. Larry Supnet is a great example of this: he has had a few shows before at Tiny's Coffee and he also frequents the cafe for its delicious brew. One day Larry went to get a coffee and came back with the 'out of the blue' news that he will be displaying another gallery in March! My plans, weather or not I will be directly volunteering at Project Grow, I will always promote the artists in my circle of influence and hopefully open many other doors for all of them.